You can find this 2010 Audi A6 4.2L Prestige and many others like it at Greenwood Automotive. When you purchase a vehicle with the CARFAX Buyback Guarantee, you're getting what you paid for. This Audi A6 4.2L Prestige is for the discerning driver who demands the utmost of his vehicle. Hit the gas pedal and put the engine power to all four wheels. With AWD, you'll have the greater performance right off the line, everytime you drive. It's not a misprint. And the odometer isn't broken. This is a very low mileage Audi A6. A rare find these days. Added comfort with contemporary style is the leather interior to heighten the quality and craftsmanship for the Audi A6 Time is money, and thanks to the navigation system on this Audi A6, you'll be spending a whole lot less time getting to your destination. This Audi A6 comes with new tires for an improved ride, better fuel economy and quieter drive. More information about the 2010 Audi A6: The Audi A6 is a comparably priced alternative to BMW's 5-series and the Mercedes-Benz E-Class, offering both performance and superb interior appointments in both full-size sedan and wagon bodystyles. The sedan offers comfortable seating for five, while the Avant wagon features the same high-quality interior as well as 33.9 cubic feet of cargo space. Safety is paramount across the line, and the optional and legendary Quattro all-wheel drive system gives excellent control even in harsh weather conditions. Interesting features of this model are Distinctive styling, top-notch interior comfort, powerful and efficient supercharged V6, available Quattro all-wheel drive. 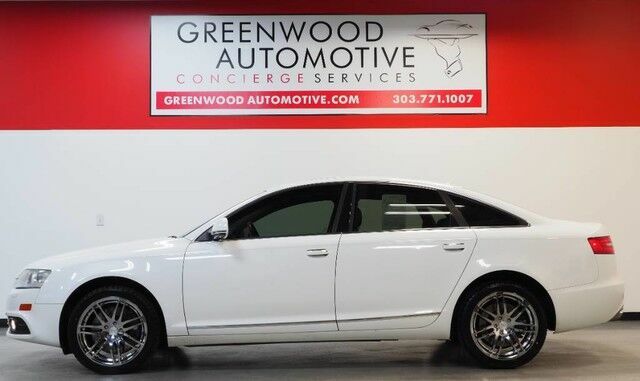 Greenwood Automotive has a wide selection of exceptional pre-owned vehicles to choose from, including this 2010 Audi A6. This AWD-equipped vehicle will handle beautifully on any terrain and in any weather condition your may find yourself in. The benefits of driving an all wheel drive vehicle, such as this Audi A6 4.2L Prestige, include superior acceleration, improved steering, and increased traction and stability. It's not a misprint. And the odometer isn't broken. This is a very low mileage Audi A6. A rare find these days. Added comfort with contemporary style is the leather interior to heighten the quality and craftsmanship for the Audi A6 Enjoy the drive without worrying about directions thanks to the built-in navigation system. More information about the 2010 Audi A6: The Audi A6 is a comparably priced alternative to BMW's 5-series and the Mercedes-Benz E-Class, offering both performance and superb interior appointments in both full-size sedan and wagon bodystyles. The sedan offers comfortable seating for five, while the Avant wagon features the same high-quality interior as well as 33.9 cubic feet of cargo space. Safety is paramount across the line, and the optional and legendary Quattro all-wheel drive system gives excellent control even in harsh weather conditions. Strengths of this model include Distinctive styling, top-notch interior comfort, powerful and efficient supercharged V6, available Quattro all-wheel drive. WWW.GREENWOODAUTOMOTIVE.COM for all Photos Our Dealer Handling fee of $499 is included in our advertised price. Government fee's and licensing are additional costs. For best service and to check availability or to set an appointment to see and drive call Steve direct at 720-339-1516 or Marc at 303-552-7909 For more information. FINANCING AVAILABLE. TRADES WELCOME. *VEHICLE IS FULLY INSPECTED BY OUR MECHANIC. We are located 4 Blocks West of I-25 on North side Of Arapahoe, Behind US Bank at Syracuse St.